There is limited clearance for tall intake manifolds. Listed below are the specifications, restrictions and necessary modifications for various manifolds. Generally, unless you use a small-diameter or narrow oval air cleaner, a hood scoop doesn't offer much advantage over a smooth hood. The scoop was added primarily so that Weber carburetors would fit. 302 Windsor, A=4.3", B=5.5" - Drop-based air cleaner. 351 Windsor, A=4.3, B=5.3" - Drop-based air cleaner. 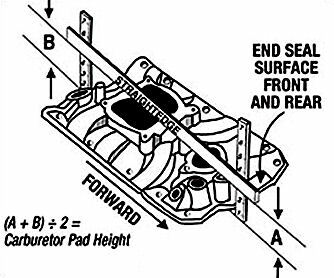 351 Windsor, A=5.3, B=6.2" - Machine 3/8" from carburetor mounting surface and use drop-based air cleaner.